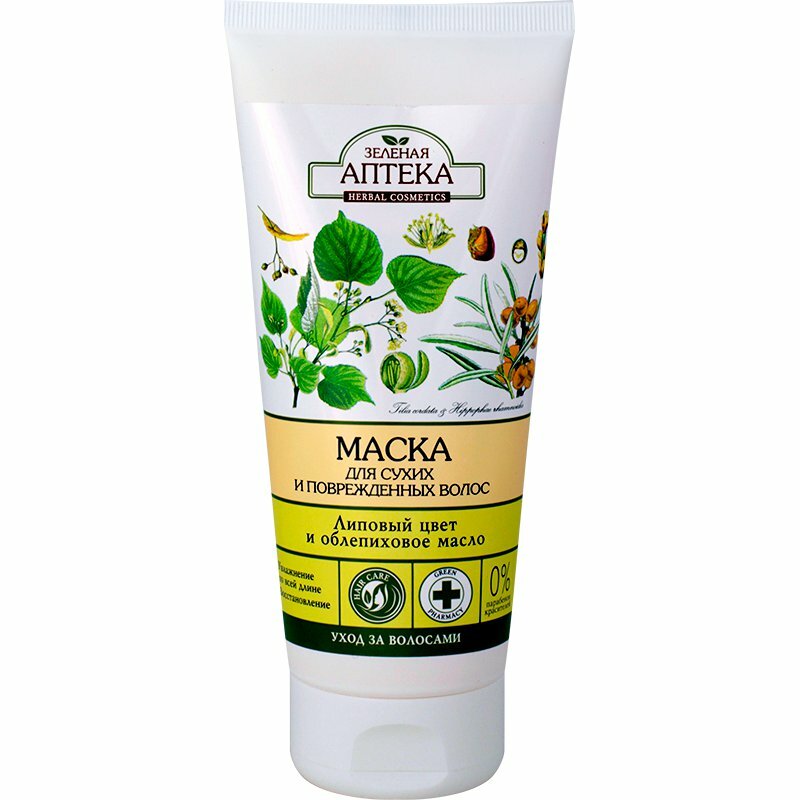 Lime Blossom and Sea Buckthorn Oil Hair Mask is produced by the Ukrainian beauty brand Green Pharmacy. It is specifically designed to moisturise and repair dry and damaged hair. The mask is packaged in a compact tube. It won’t take up much space in your bathroom or in your suitcase. This Green Pharmacy hair mask provides intensive nutrition and helps to retain moisture deep within the hair structure, repairs damaged hair and makes it softer and tamer. The product is perfect for hair which is often exposed to blow-drying and hot styling with flat iron, curling iron, etc. The mask contains lime (linden) blossom extract and sea buckthorn oil. It effectively softens your hair, restores its natural elasticity, makes it look shiny, moisturises the hair along its entire length and makes your locks smoother. The mask is free of parabens and colourants. Directions. Apply a necessary amount of mask onto hair roots. Spread evenly along the entire hair length. Leave for 2 to 3 minutes. Rinse. Best used 2 or 3 times a week. Ingredients. Aqua, Cetearyl Alcohol, Cetrimonium Chloride, Potassium Cetyl Phosphate, Dimethiconol, Cyclopentasiloxane, Butyrospermum Parkii Butter, Glycerin, Behentrimonium Chloride, Paraffinum Liquidum, Tilia Cordata Flower Extract, Hippophae Rhamnoides Oil, Beta-Carotene, Citric Acid, Parfum, Benzyl Alcohol, Methylchloroisothiazolinone, Methylisothiazolinone, Propylene Glycol, Diazolidinyl Urea, Iodopropynyl Butylcarbamate. Want to buy Lime Blossom and Sea Buckthorn Oil Hair Mask? Call us or submit your order via our web site!